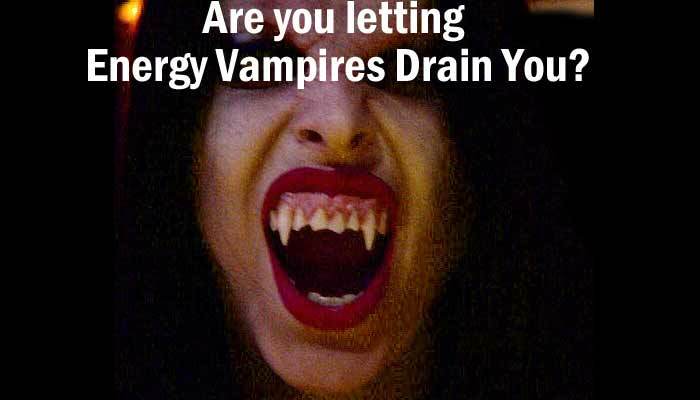 Are Vampires Stealing Your Energy? We all live among the energy vampires but few of us know it, unless we happen to be living among a nest of them. My wife and I found ourselves getting drained of energy when we lived for a time in one specific community. That was when we learned not only that such people exist, but we found a way to shield ourselves against their daily assaults. People who drain your energy are not evil. They don’t look like the Hollywood stereotype vampire, they don’t drain our blood and they don’t prowl at night. They could be a friendly neighbor or president of the local school board. What they do . . . and sometimes they may not even realize they are doing it . . . is that they have a strange way of sucking away our energy when we get too close. I believe some of them do it on purpose. We all know that strange feeling of returning home from a large gathering of people and feeling so tired that we just want to collapse for a while and take a nap. Or we might come home with a severe headache. During my years working as a news reporter I found that after working among large crowds I often returned home with these symptoms. It was not until the problem hit us hard, while living with a community of vampires, that my wife and I recognized what was happening and found a way to deal with it. It all involves mental warfare. The vampires are mentally attacking us and we just need to know how to recognize what they are doing and put up our guard. The best defense is to simply ground ourselves daily before leaving the home. Continue to do it throughout the day before coming in contact with others. Grounding is also a mental exercise. To do this you imagine yourself mentally traveling from the head and dropping down through the body, through your feet and into the Earth below, then continuing on to the very core of the planet. It only takes a few moments to do this mental exercise, but it seems to work. At least it did for us. You might think this is all hokey-pokey and that James Donahue has lost his marbles to be writing such a strange article. But believe it or not, our findings have recently been backed up by real science. Dr. Olaf Kruse, a biologist at Bielefeld University in Germany, has just published research showing that plants draw energy from each other to survive. He believes people do this too. The findings of the Kruse study appeared in Nature Communications Journal online. He and his team found that a green alga within the plants not only engages in photosynthesis, but draws a form of energy from neighboring plants to help acquire calories from food, minerals from water, and carbon dioxide to survive and grow. In his report, Kruse suggests strongly that because plants do this, there is strong evidence that humans also absorb energy from one another in a similar way. He then compared the behavior to human beings. “This is exactly why there are certain people who feel uncomfortable in specific group settings where there is a mix of energy and emotions. When energy studies become more advanced in the coming years, we will eventually see this translated to human beings as well. The human organism is very much like a plant, it draws needed energy to feed emotional states and this can essentially energize cells or cause increases in cortisol and catabolize cells depending on the emotional trigger. “Human can absorb and heal through other humans, animals, and any part of nature. That’s why being around nature is often uplifting and energizing for so many people,” he concluded.